One of the most challenging parts of deploying your application in the cloud is to set up a proper infrastructure, common tasks like creating a VPC, configuring auto-scaling, load balancers and gateways rapidly become time-consuming and cumbersome. That’s is why we developed in partnership with the guys from ClearScale a Couchbase Quick Start AWS Deployment, it helps you to set up Couchbase Server and Sync Gateway in minutes using all AWS best practices to make your deployment secure and easy to scale. Check out the step-by-step documentation here. First of all, deploying this Quick Start for a new virtual private cloud (VPC) with default parameters will build the following Couchbase environment in the AWS Cloud. 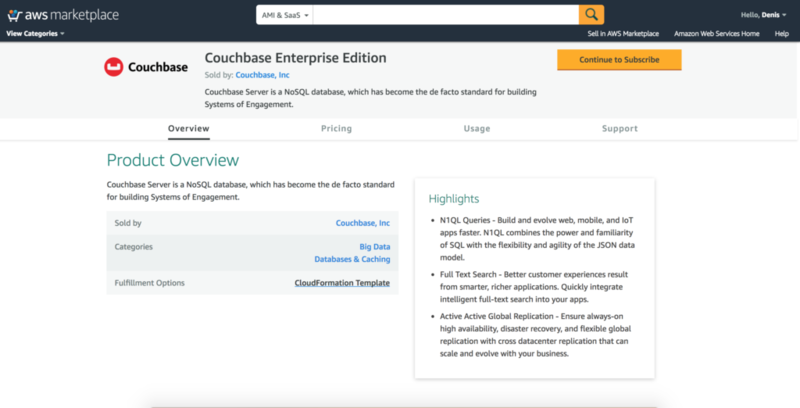 Go to Couchbase Enterprise Edition on AWS Marketplace, and then click on Continue to subscribe. Tip: Double check that you are in the correct AWS Region. I highly recommend you here to read the official documentation, it explains exactly how to fill out all fields. Once you finish, click on Next. Congratulations! Now all you have to do is to wait for your stack to be created, go grab a cup of coffee as it will take a few minutes. Once your stack state is CREATE_COMPLETE, click on Resources tab, choose the physical ID for ServerAutoScalingGroup. The Auto Scaling group will be displayed in the Amazon EC2 console, choose the Instances tab, and then pick one of the instances to view its details. In the Description tab of the instance, copy the public DNS name. The login screen for the Couchbase Web Console will be displayed. Inform the user and password defined in the Specify Details page during the stack creation and log into your new Couchbase Server instance running on AWS. NOTE: In the image above we are allowing inbound traffic from anywhere, in your cluster please allow inbound traffic only from your network. An invalid configuration was provided in the Specify Details page . In the network diagram, I see a load-balancer (lb). Could you please explain what is the role of the lb (in this scenario) and what type of a lb it is?